Thank you to my friends at JetPens for sponsoring this post. Because of their sponsorship, the Pilot Kaküno reviewed here was free to me. 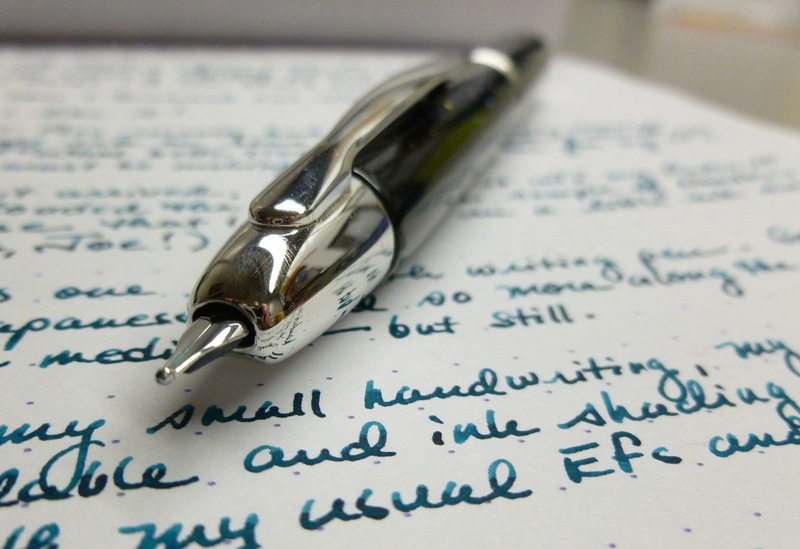 This review reflects my experiences and observations with the pen. 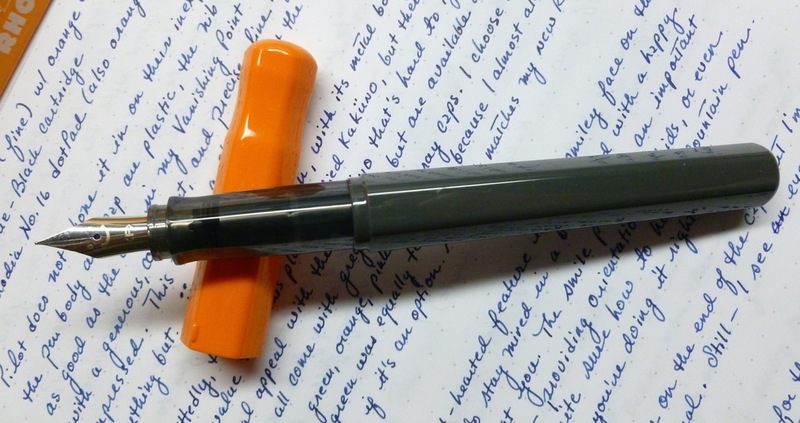 I’ll be honest— though the metal-bodied Pilot Metropolitan is undoubtedly a better value than the Pilot Kaküno, the whimsical appeal of the Kaküno is hard to ignore. 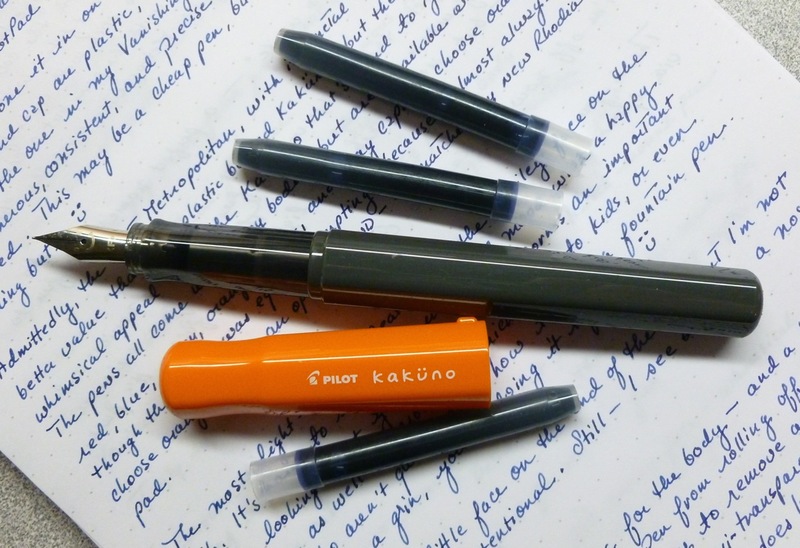 Despite having an all plastic body and cap, and a slightly higher price tag than the Metropolitan, I can’t resist the charm of the Kaküno. Touted as the perfect pen for children and adult beginners, its superb nib makes the Kaküno worthy of a look by even experienced fountain pen users. Each pen comes with a gray body, but the red, blue, green, orange, pink, or gray cap choices make this a fun-looking pen despite the subdued color of the body. (Unless you choose gray. But why would you?) I chose the orange version— though the green one tugged at me, too— because I almost always choose orange if it’s an option. AND it matches my new Rhodia dotPad. Which, of course, is critical. Pilot uses sturdy plastic for the body, and a hexagonal shape that keeps this clipless pen from rolling off of a desk. The snap cap is quick and easy to remove and replace, and posts solidly. The triangular(ish), semi-transparent section is less severely molded than that on the Lamy Safari, but should help newbies settle into a proper and comfortable grip. The pen is LIGHT- just 13 grams (9g body, 4g cap)— which is why it’s such an appealing pen for children. If you require heft in your pens, move along. But if you like a bit of fun AND and an awesome nib, keep reading. When I look at the end of the Kaküno’s cap, I see a little face. It reminds me of that kid’s expression in “Home Alone” when he finds out that he is, in fact, home alone. “OH NO!” I’m not sure if this is an intentional feature, but I think it’s kind of cute. 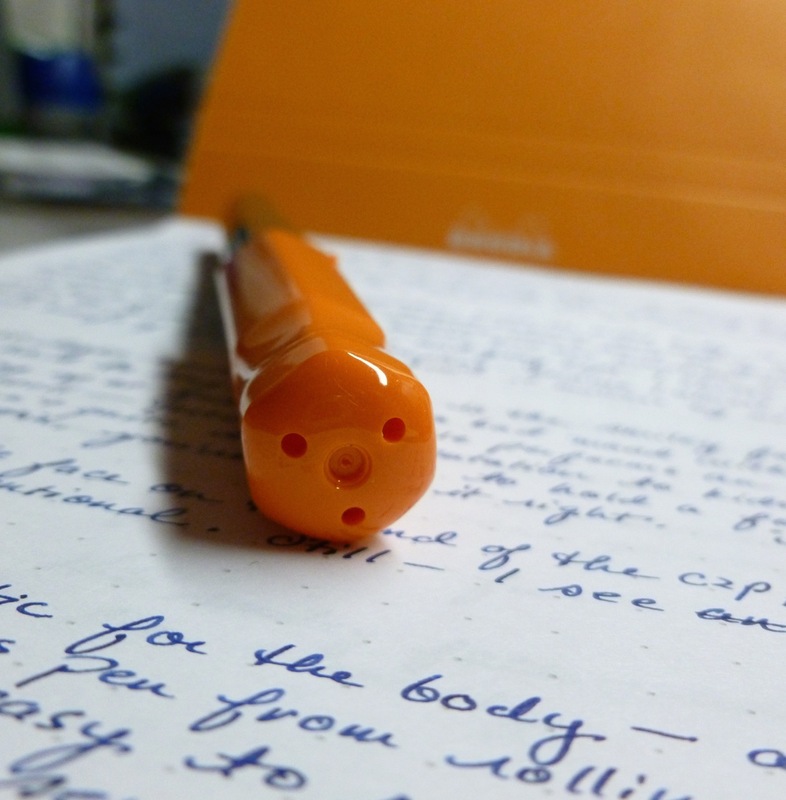 The most light-hearted feature is the smiley face on the pen’s steel nib. It’s hard to stay mired in a sour mood with a happy face looking up at you as you tackle your work. The smile performs an important function while also providing a little levity. 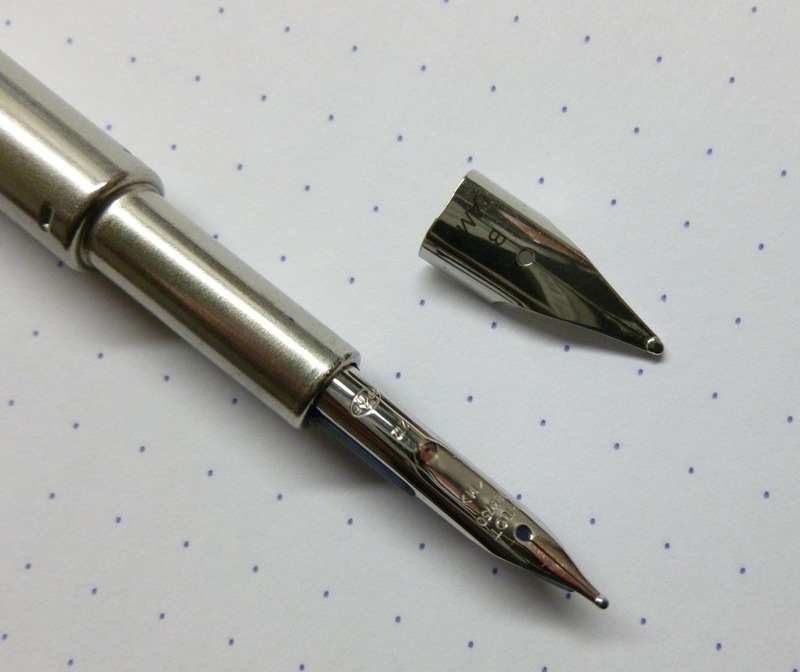 It signals the correct orientation of the nib to kids—or even to uninitiated adults—who might not be quite sure how to correctly hold a fountain pen. If you see a grin, you’re doing it right! 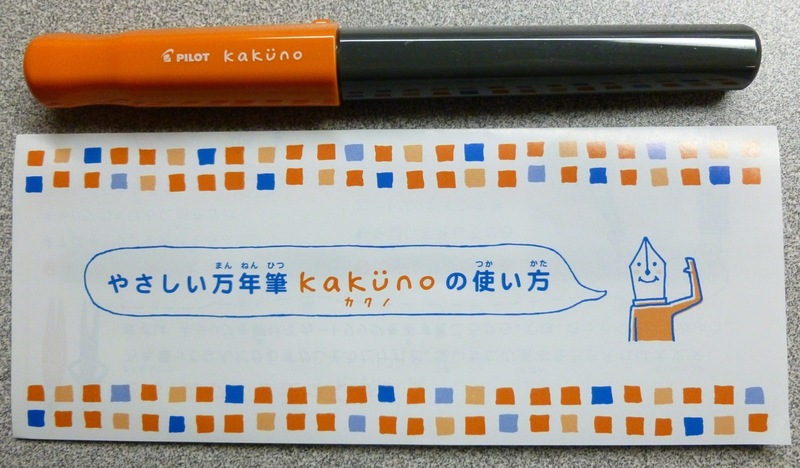 Even the word Kaküno, which means “to write” in Japanese, contains a tiny smile! KAKÜNO. See the eyes over the grin the “u” makes? Cute. I choose to keep things simple— as a beginner might— and installed a Blue/Black Pilot-Namiki cartridge that I happened to have in my ink stash. The Kaküno can be outfitted with a CON-20 or CON-50 converter, but I’m probably going to stick with the cartridges for now. One black cartridge is included with the pen but a converter is not, which is another reason why the Metropolitan wins the empirical “best value” contest. I’ll be attending a conference in July and am already planning to take my Kaküno to Indy with me. I hate taking dear or pricey pens when I travel in case they get waylaid in the airport shuffle or I just stupidly leave them behind (unlikely, but possible). For that reason, my Lamy Safaris, Pilot Metropolitans, and now, this Pilot Kaküno—all with lightweight price tags— are the perfect candidates for travel. The Kaküno is a low-stress, high amusement pen that makes writing fun and easy for kids, adult novices, and even veteran users. 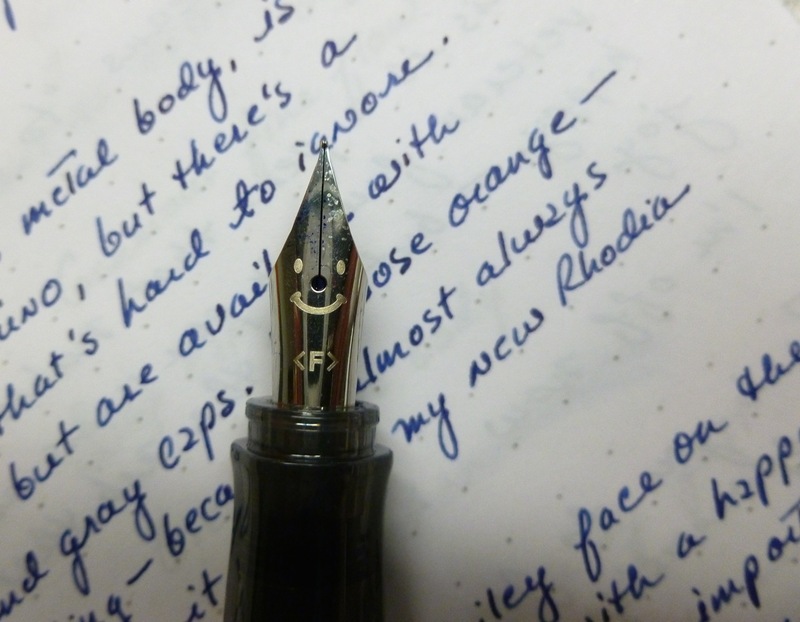 The nib’s happy face makes me smile, but it’s the nib’s performance that REALLY lights up my face. 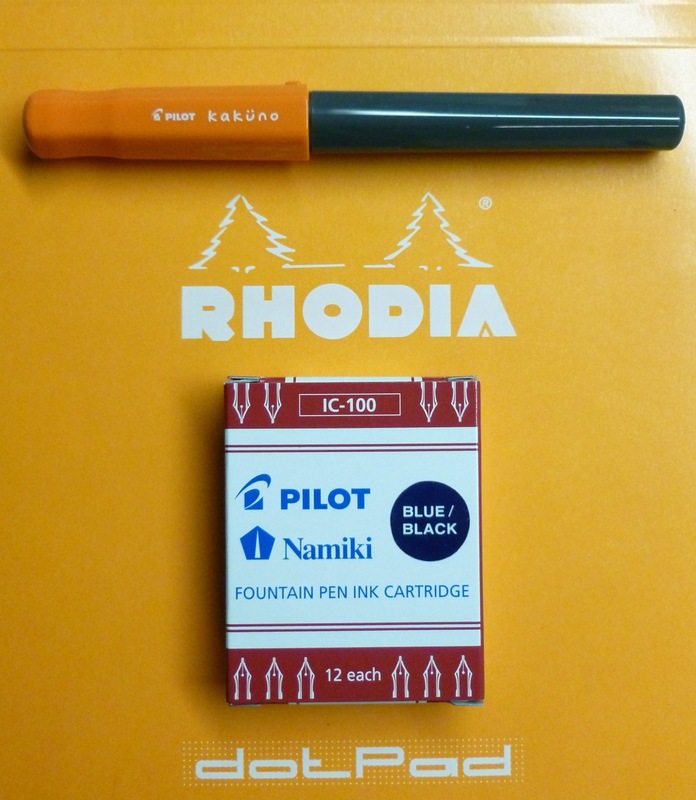 The Pilot Kaküno is available from JetPens for $16.50. The CON-20 and CON-50 converters are also available, along with Pilot/Namiki cartridges. There are no affiliate links in this post. Thanks, again, to Elaine at JetPens for making this post possible. 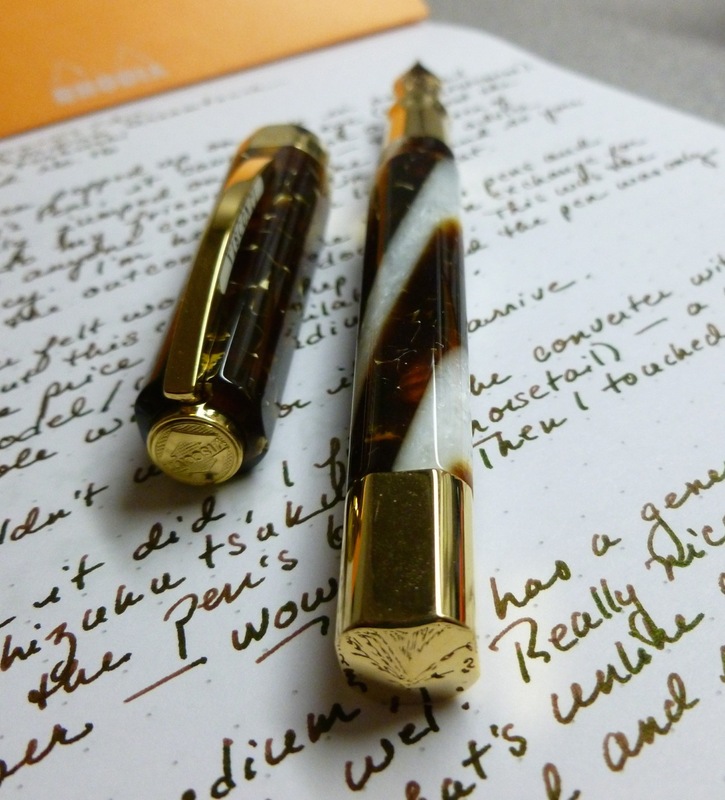 For the official Pen Addict’s take on the same pen, check out Brad Dowdy’s review HERE. 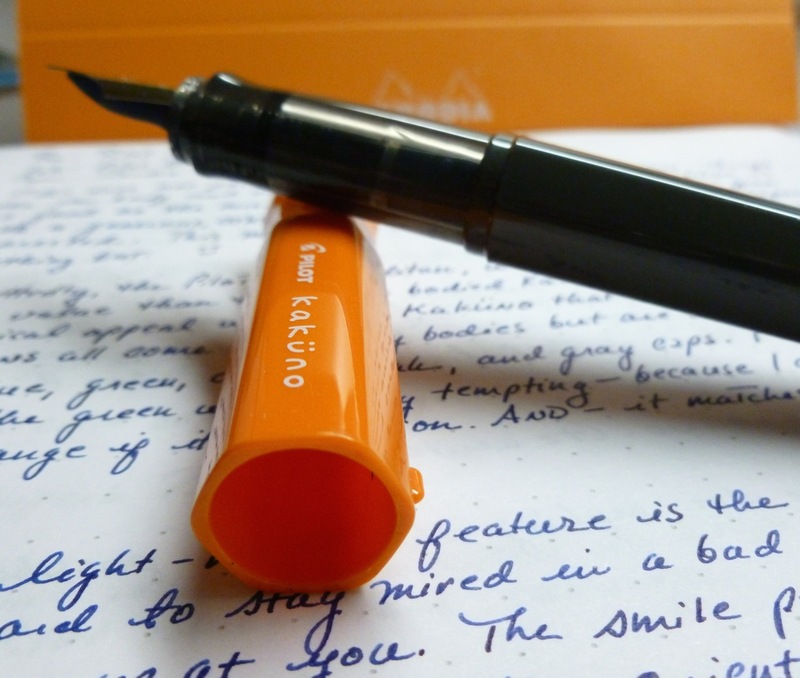 Bob, of My Pen Needs Ink, reviews the Kaküno HERE. A couple of weeks ago, I was blabbing about my love for all things stealth, like pens with black matte bodies and all-black nibs. I DO love those. I really do. But then I saw THIS pen on the Goulet Pens site and it’s obviously as “anti-stealth” as a pen can get. 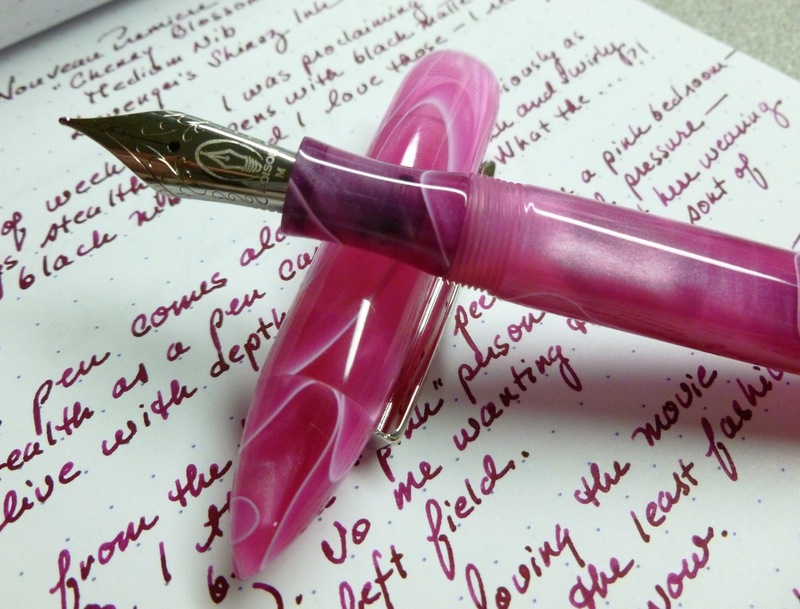 It’s pink and swirly and alive with depth and sheen. And it spoke to me. LOUDLY. Quite frankly, it would not shut up. Let’s set the groundwork— I’m not a pink person (she says, as she sits here wearing a pink shirt). Well, I did request a pink room when I was eight, but I chalk that up to falling for the “girl’s room = pink” stereotype of my youth. I’m much more drawn to earthy colors, and taupe. Lots of taupe. 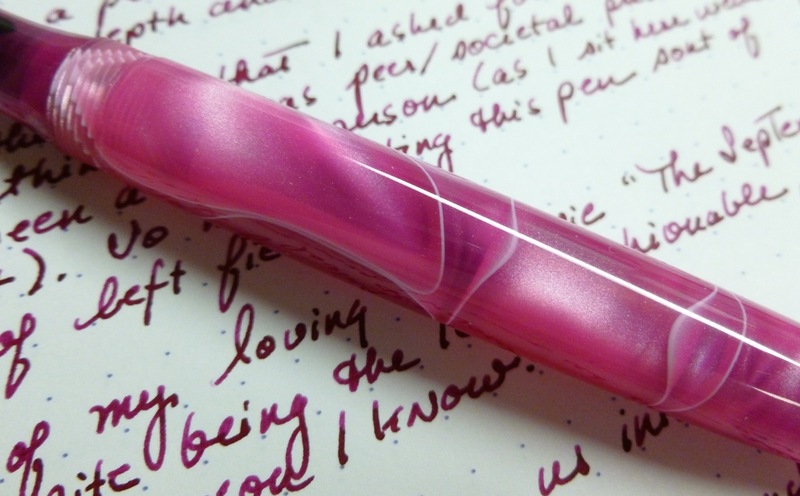 So me wanting this pink pen sort of came out of left field. It’s like how I LOVE the movie “The September Issue” despite being one of the least fashionable, comfort-trumps-all people I know. That movie, about the making of the September issue of Vogue magazine, is packed with moments of beauty, creative genius, and hard work. This pen, it seems to me, is packed with those as well. 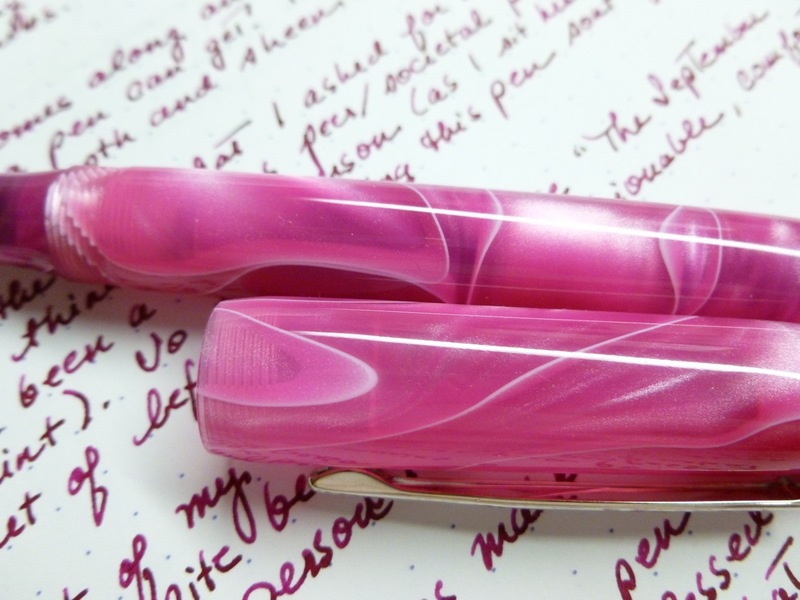 The Edison Nouveau Premiere model features a pointed body and cap, which makes it look a little “stabby.” That slightly tactical look, coupled with the luscious pink swirls, makes the pen that much more appealing to me. It’s like it’s tough and soft at the same time, which is a cool mix. 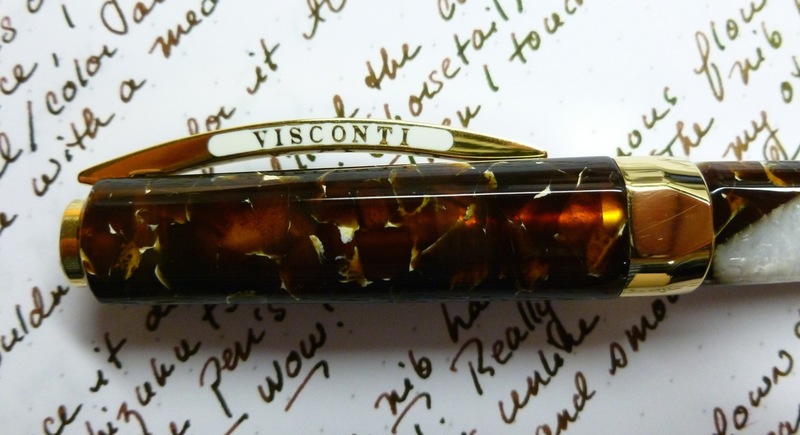 One of my favorite things about the look of this pen is the translucency— how you can catch a glimpse of the nib and converter inside the pen. Coupled with the sheen and the swirls, this is, to me, the perfect look— full of interest and surprises. 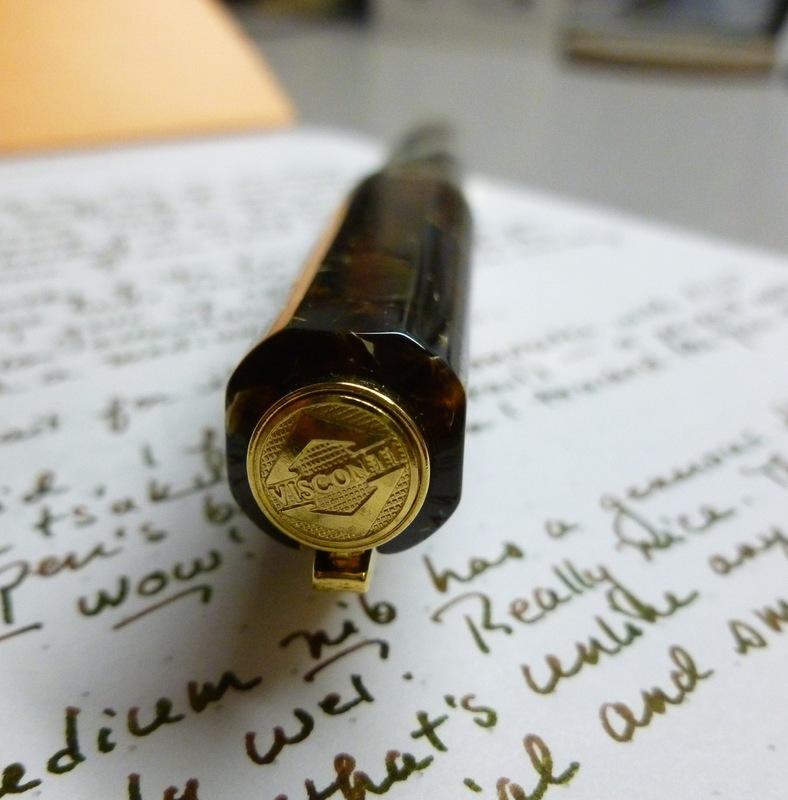 The pen is a light one— 17g overall (10g body, 7g cap). This coupled with the nicely tapered grip makes it a great candidate for long writing sessions. The cap doesn’t post, but the uncapped body measures 5-1/8″ making it perfectly usable for just about everybody. I ordered the pen with a medium steel nib, and after a bit of debate, filled the included converter with my beloved Levenger Shiraz ink. 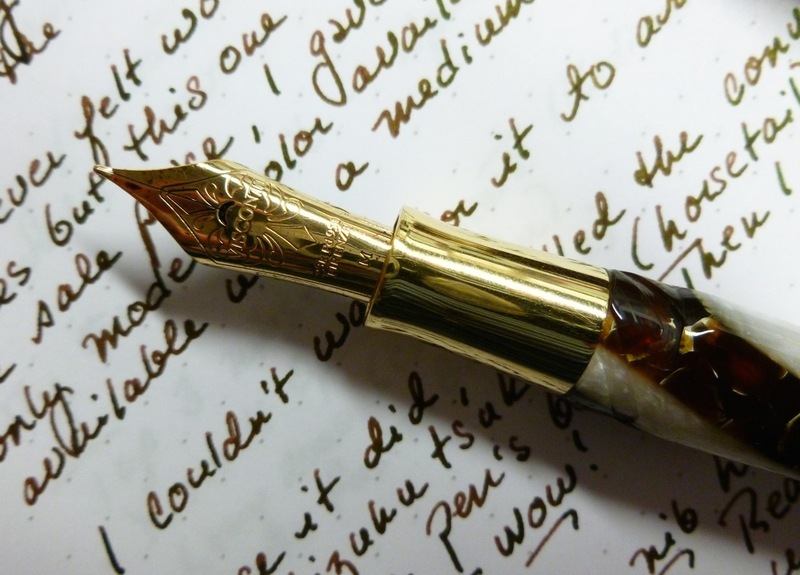 This is a “we were meant to be together” pairing, and writing letters and notes with this pen/ink is a true pleasure. The nib writes wonderfully. It’s juicy, with just a touch of feedback. No hard starts, no skipping. The ink always flows even if I’ve left the pen sitting for a couple of days. What’s really nice is that the #6 nibs are easily swappable. Just screw out one nib unit and screw in another. Because of this, I ordered a couple of spare nibs with my pen— a fine as well as a 1.1mm stub. It’s like having three pens in one for just a little more money. 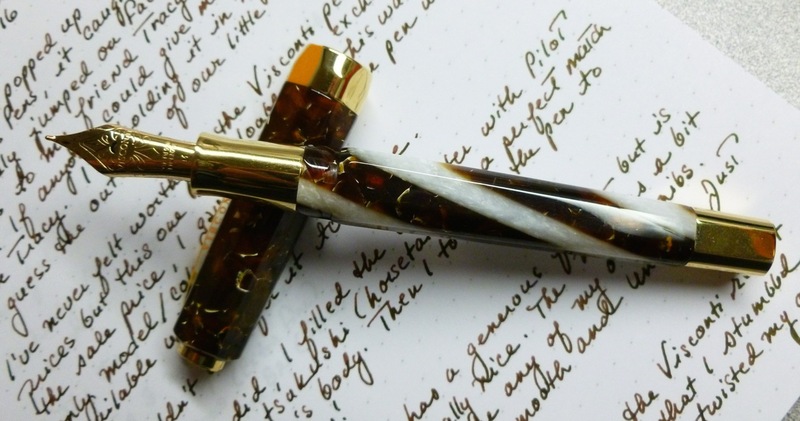 As noted on the Goulet Pens website, “Edison Nouveau is a joint collaboration between Brian Gray of the Edison Pen Company, and Brian Goulet of the Goulet Pen Company. 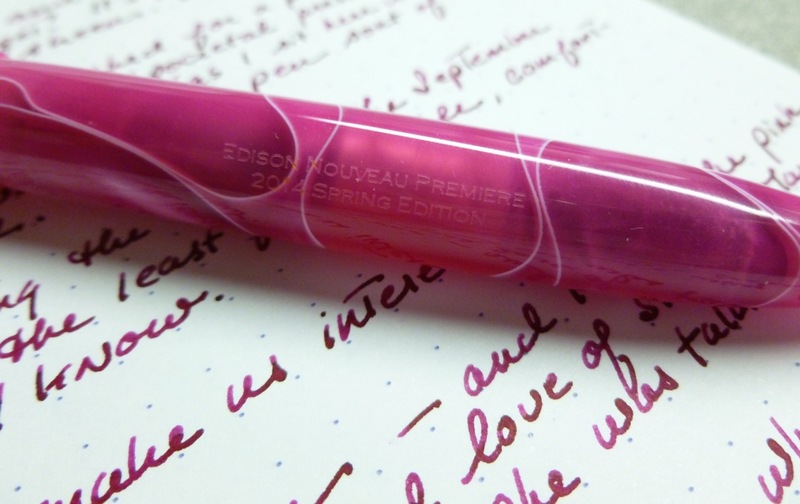 This is an exclusive line of Edison fountain pens available only through the Goulet Pen Company.” Branding is super subtle, and notes that this is the 2014 Spring Edition of the Edison Nouveau Premiere, meaning this version will only be available until mid/late June. It’s not a limited edition pen (i.e., there aren’t a limited number available), rather it’s available during a limited timeframe. I’m already anxious to see the 2014 Summer and Fall versions. 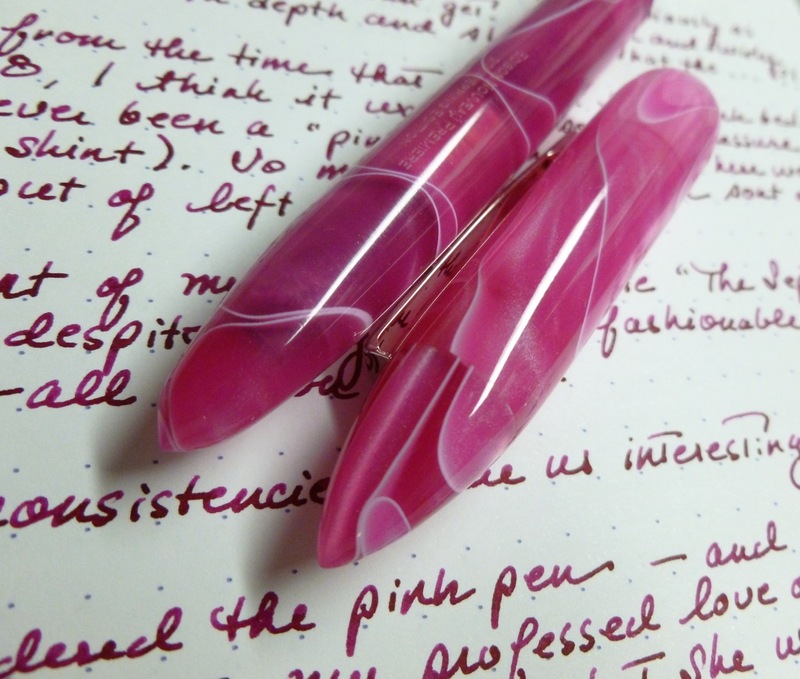 But for now, I love my pink Edison Nouveau Premiere, despite my professed love of black stealthy pens. (It’s our inconsistencies that make us interesting, right?) 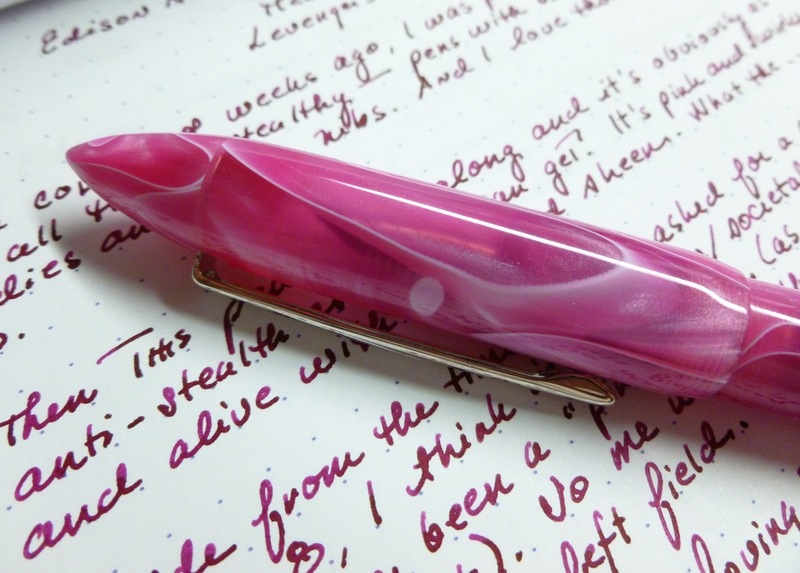 This pen positively POPS and sparkles and shines. It’s bright, it’s fun, it’s fresh and swirly. It is the Cherry Blossom. 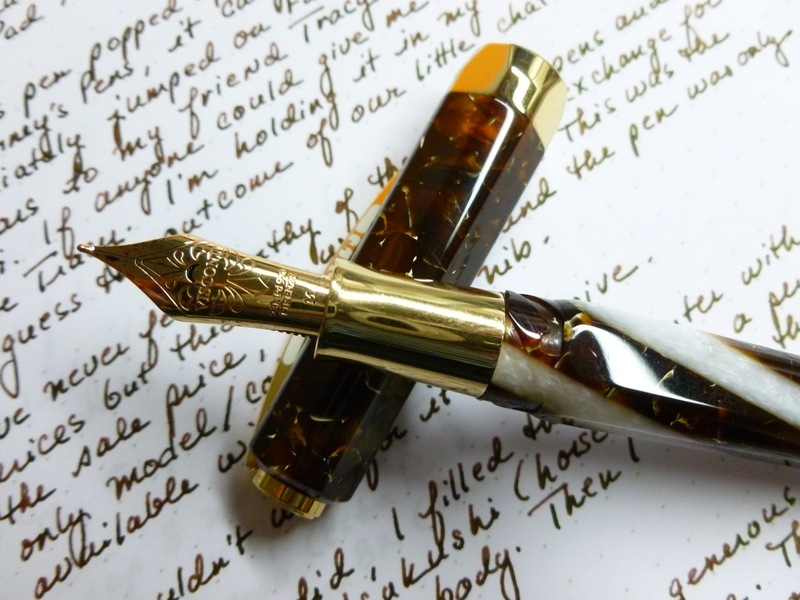 So I picked up a broad……..nib. Never say never. Though I thought I would forever be an extra-fine/fine woman (we’re talking nibs here), watching all of those SBREBrown pen review videos (that man loves him some B, BB, and even BBB nibs), and receiving letters from friends who swear by juicy, fat nibs, I cracked. I had to explore. 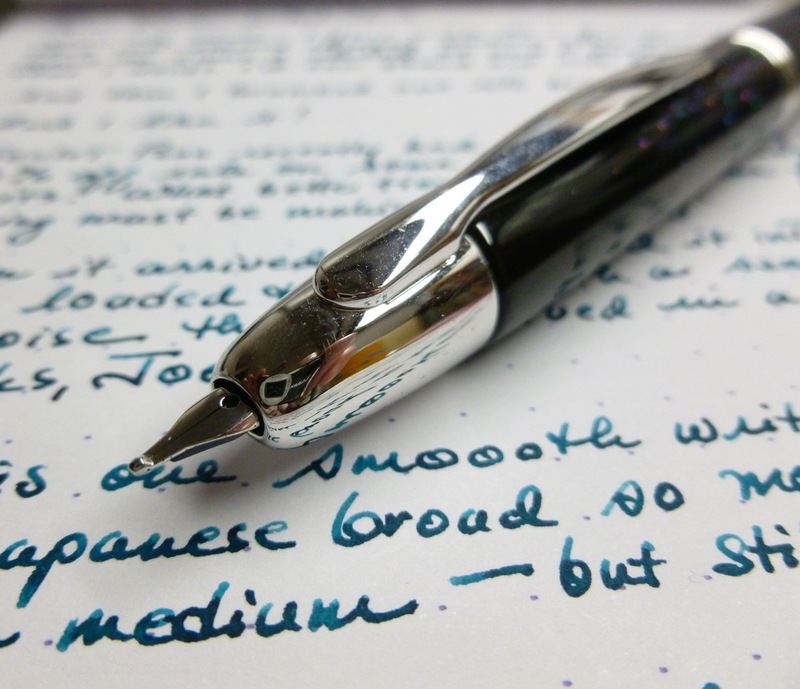 Goulet Pens recently ran a “Spring Cleaning” 20% off promotion on a number of items, including the Pilot Vanishing Point nib units. What a perfect time to branch out a bit. When the broad VP nib unit arrived, I popped it into my beloved and sparkly Raden VP (thanks, Dan! ), loaded it from a sample vial of Noodler’s Turquoise (thanks, Joe! ), pulled out some Tomoe River paper and let it fly. I kind of get it now. Maybe I MORE THAN get it now. While I won’t be using broad nibs for my everyday writing— my handwriting is just too small for that— I can totally see myself transitioning to them for letter writing, when I can use my Tomoe River or Clairfontaine Triomphe paper, and when I really like seeing how an ink shades. Granted, the Vanishing Point broad is, since it’s Japanese, more like a European medium, but still. I’d stepped away from my comfort zone and had to admit that it felt…well…comfortable. Wonderfully smooth. Nicely juicy. Getting back to my point (and my G-rating), all I’m trying to say is that it’s cool to take a pen body that you love, and swap in some different nibs for a completely different writing experience. The VPs are great for this, as are, of course, Lamys and TWSBIs. I see that Richard Binder offers Vanishing Point pen bodies (even the new metallics) separately, so I may go that route when I decide to spring for the cool looking green metallic. That’ll save me about $60. 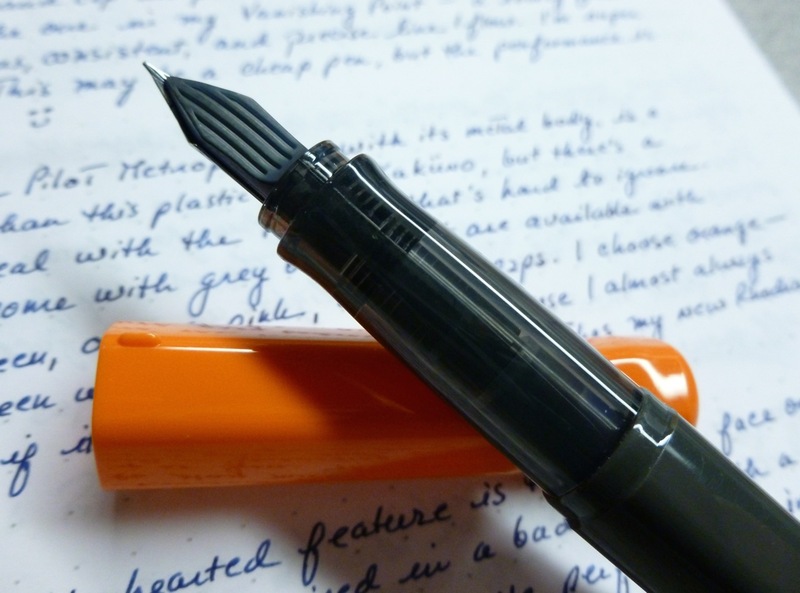 Since I own a range of nib units to swap in, why buy another complete pen? When I ordered the broad VP nib unit, I also picked up a Lamy broad nib as these are crazy easy to swap in and out of several Lamy pen models. 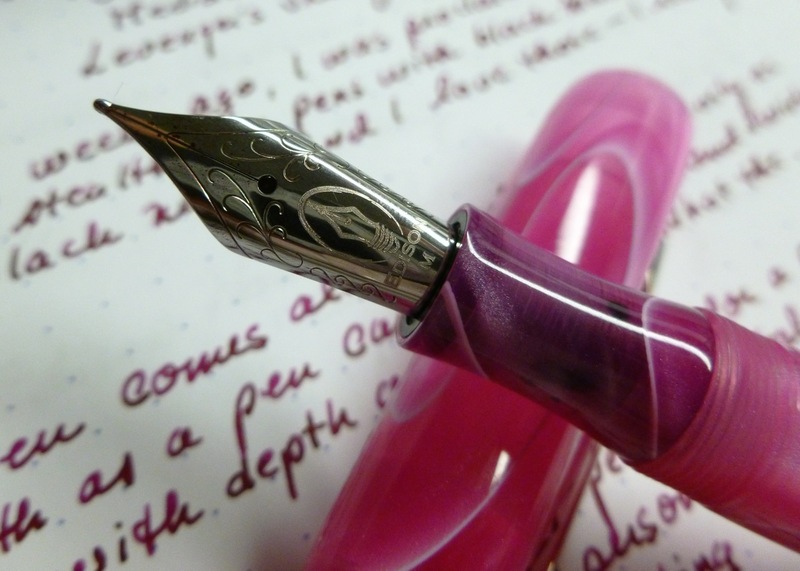 And when I recently purchased my Edison Nouveau Premiere Cherry Blossom with a medium nib, I tossed a fine and a 1.1 mm stub into my shopping cart, as well. One gorgeous looking pen, three different writing options. So have fun. Experiment. With nibs, I mean.